"Designed for stroke caregivers, this is the ultimate companion to help you make it through those seemingly insurmountable everyday challenges. 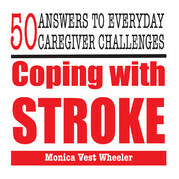 Coping with Stroke: 50 Answers to Everyday Caregiver Challenges is designed as a guidebook to which you can turn at any moment for inspirational and realistic advice that will help you make it through the challenges you face caring for a loved one who has suffered a stroke. Simple, concise and amazingly informative, this book is just for you if you’re struggling with the physical and emotional challenges of being the one in charge of a stroke survivor’s care. This compact volume is filled with the best and most practical first-hand quotes, insights and tips you’ll ever find on coping with the emotional challenges of dealing with stroke as a caregiver. "